Heathrow, Britain's largest and busiest airport, is eager to switch to zero-emission all-electric vehicles. Some 8,000 vehicles (including third party rides) are licensed to operate airside at Heathrow. Now to lead a new generation, a part of that fleet has been replaced by 17 Nissan LEAFs. 12 of the LEAFs (we still want to say Leaves) will be operated airside by teams including security and baggage, while another five are being used as pool cars. Heathrow airport intends to have all cars and small vans electrified (all-electric or plug-in hybrid) by 2020. 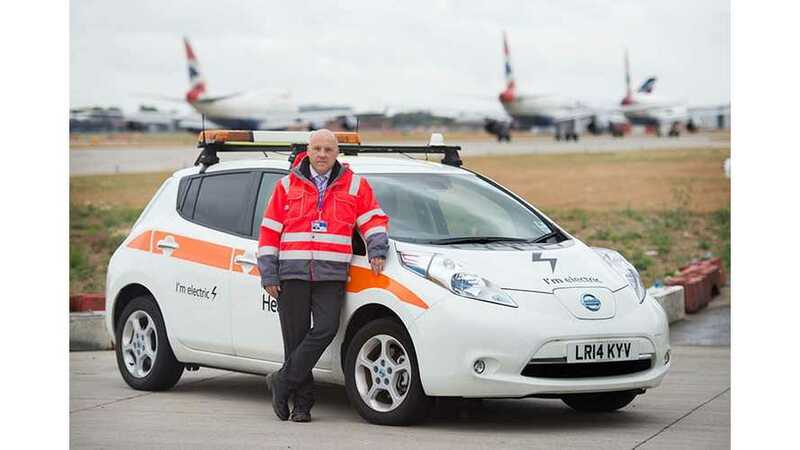 "By introducing the vehicles in highly visible airside roles and operating them successfully, it hopes to encourage the many third parties that operate thousands of vehicles around the Heathrow campus to follow suit." "Through Heathrow 2.0, our plan for sustainable growth, we are aiming to establish Heathrow as a world-leading airport in reducing emissions from all sources of activity. A key part of this is by targeting the conversion of 100% of Heathrow's cars and small vans to electric or plug-in hybrid by 2020, with ultra-low emission standards for all airside vehicles to follow by 2025. We trialed the Nissan LEAF and found it was the perfect fit for many of our teams and the types of journeys they make. The trial went seamlessly, and within months we placed our order and put the LEAF into full time service." "We are delighted to be supporting Heathrow Airport as it takes such a positive step towards changing the culture of vehicle usage onsite and improving its sustainability. I'm sure this initiative will inspire other businesses to follow Heathrow's lead by using Nissan's electric vehicles to both reduce their emissions and cut their running costs."